A switch from forward to defense paid dividends for Chad Ruhwedel when he was a Pee Wee, helping the La Jolla Jaguars win a California Amateur Hockey Association state title. And it’s continued to pay off more than a decade later as he’s carved out a solid professional hockey career. 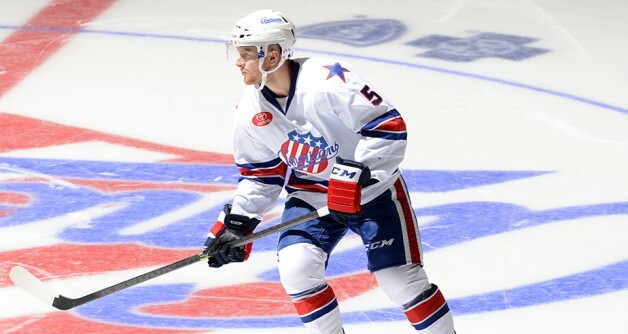 In between playing 32 games for the Buffalo Sabres over the past three seasons, he’s spent the rest of that time as a highly productive, smooth-skating blueliner for the American Hockey League’s Rochester Americans. That came on the heels of a three-year career with UMass-Lowell, capped by a trip to the Frozen Four in 2013. California Rubber: What was your favorite hockey memory growing up? Chad Ruhwedel: Probably winning the Pee Wee AA state championship with the La Jolla Jaguars. That was one of the cooler moments of my youth hockey career. CR: Playing in my first NHL game was really cool – something I won’t forget. My junior year of college, winning the Hockey East regular-season and tournament titles before losing in the Frozen Four was a very exciting time, too. CR: Who have been the biggest influences on you, on and off the ice? CR: Off the ice, it’s my parents (John and Robin). The support they give me even to this day – just watching every game – that stuff goes a long ways with me. On the ice, I’ve had a lot of really good coaches over the years so it’s tough to say. I had a really good college coach (Norm Bazin). My junior coach in the United States Hockey League (Kevin Hartzell with the Sioux Falls Stampete) left a really good impression on me, too. There have been a lot who’ve steered me in the right direction. CR: What the best piece of advice you have for young hockey players? CR: If it’s a sport you really love and want to pursue, put all your resources there. It’s not easy; there’s a lot of traveling and commitment. I realized that all of my best friends from my childhood are hockey-related, old teammates. It’s a good path to take and it’s brought me nothing but happiness throughout my career. CR: Golf. I’m not always happy with how I play, but it’s the one I play the most. CR: What does your game-day routine look like? CR: I wake up and head to the rink for breakfast, have a morning skate, practice and try to keep it pretty brief to save my energy. I make my own pregame meals when we’re home, usually chicken and rice or couscous. Then I take a nap, wake up and get another something little to eat like a peanut butter sandwich or a granola bar. Then I head to the rink around 4:30 for meetings, and play some soccer beforehand, too. CR: Are there are any pieces of gear you’re especially particular about? CR: I’m pretty particular with my skates and laces; I have to have new laces at least once a week. Also sticks – one stick won’t be used for more than two games; after that, it gets moved to a practice stick and a new one comes out. My gloves – I like to get them washed and dried; wet gloves are a big pet peeve of mine. CR: What are some essential items you take on road trips? CR: I always have a good set of headphones. I don’t tend to bring my laptop or iPad on the road, but a lot of guys are big into TV shows or movies. A lot of cell phone video games and a deck of cards for the long trips. I’m good at sleeping on the bus. CR: When you’re back in California, do you have a favorite restaurant you frequent? CR: I eat a lot of Mexican food and a lot of sushi when I’m home. There’s a place in San Diego called Sushi Deli I try to go to once a week with my buddies. CR: It was Joe Sakic when I was younger and playing forward. When I was older – more towards high school – it was Scott Niedermayer. CR: If you weren’t playing pro hockey, what do you think you’d be doing for a living? CR: I would’ve graduated school and probably be working in the business world back home in San Diego. If not that, then I’d be pursuing coaching. When I was younger I did some refereeing, and playing at a high level gets your foot in the door a lot faster there, so that could be a possibility as well. CR: What’s the most challenging aspect of playing pro hockey? CR: At the end of the day, it’s a business; it’s a job. It’s not whether you think you deserve to be playing somewhere or not. The team, the management, the ownership – they’re going to do what it takes to win whether you’re part of the equation or not. It’s a team sport, but there’s a lot of requirements individually you need to meet. CR: What’s the funniest hockey prank you’ve witnessed or been a part of? CR: I’ve seen a lot of funny things with gear, like guys getting the steel taken out of their skates and not knowing it, or their sticks getting filled up with water. Chalk Talk: Should your child stay home or move to develop?